There were two unusual days of action over the weekend in the Manx Petroleum sponsored Outdoor Winter Bowling League, Saturday saw averages drop for the four teams and the following day they all increased. The leading two were participants on the first afternoon and they remain out in front after the day’s results which saw two victories for Mooragh Lakers and one defeat, followed by a maximum win for Seven-Up. Unstopabowls were also playing and they began with a successful outing against Seven-Up, winning 113 to 98; this while Lakers dropped six points in a comfortable victory over Castletown Cannons. Seven-Up then rallied to record their fourth full-house to date, whilst their southern opponents Castletown Cannons slipped into the bottom two. The session concluded with another big fixture, when leaders Lakers got the better of third placed Unstopabowls by the close margin of six, both teams dropping valuable points. Match details being as follows (Lakers first): Jenny Moore 21, Alan Moore 18; Adrian Skinner 11, Glynn Hargraves 21; Steve Parker 21, Stefan Kelly 9; Rob Monk 21, Elaine Moore 17, Brian Kelly 21, Steve Waters 19; Steve Moore and James Teare 16, Kim Hargraves and Glen Boland 21. Lakers 111 (4), Unstopabowls 105 (2). Remaining results for Saturday, November 12: Castletown Cannons 70 (1), Lakers 120 (5); Unstopabowls 113 (4), Seven-Up 98 (2); Seven-Up 126 (6), Cannons 81 (0). Sunday had four teams from the bottom half of the table competing and they all went home with a win apiece and improved averages for their endeavours. Govags racked up 119, the highest total, with a good win over Erin Porters, whilst Castletown Corkers recorded their first win of the season and dropped just eight points against Bits n Bobs. Porters and Bits n Bobs then got the better of the previous two victors, Porters defeating bottom team Corkers, and Bits n Bobs getting the better of Govags. Results for Sunday, November 13: Erin Porters 108 (3), Govags 119 (3); Bits n Bobs 107 (3), Castletown Corkers 118 (3); Corkers 95 (2), Porters 115 (4); Govags 100 (2), Bits n Bobs 112 (4). A gang of 30 took part in the midweek round robin and after being separated into two sets of triples the winners were Alan Phair, Janet Monk and Peter Karran in the black group, and Philippa Taylor, Bob Coker and Bernard Thackrah in the yellow gang. Runners-up being Derek Cadamy, Pauline Worrall and Jean Thackrah; along with Tom Wilson, Julie Reilly and Vicky Lloyd-West. Erin Porters notched up the highest points total over the weekend in the Manx Petroleum sponsored Outdoor Winter Bowling League dropping just 10 as they recorded two good victories. They began by notching up the season’s eighth maximum in their outing against Castletown Cannons, whilst Unstopabowls came close to number nine with a 123-81 success over Bits n Bobs. Porters then won a close encounter in the battle of the two first winners, with Bits n Bobs getting the better of Cannons and improved their average in the process. Match details (Cannons first): Joy Stephens 20, Andy Morgan 21; Alan Phair 21, Edwina Reid 19; Elaine McElroy 14, Dot Mylchreest 21; John Alderson 15, Tim Williams 21; Peter Curtis 21, Gill Morgan 11; Bob Daggett and Joyce Kiernan 6, Geoff Mayles and Allan Kennaugh 21. Castletown Cannons 97 (2), Bits n Bobs 114 (4). Remaining results for Saturday, November 5: Erin Porters 126 (6), Castletown Cannons 72 (0); Bits n Bobs 81 (1), Unstopabowls 123 (5); Unstopabowls 108 (3), Erin Porters 116 (3). Sunday saw another two scores very close to maximums when Louie’s Angels and Parkers dropped five points between them, but it was Outsiders who fared best as they did enough to move into fourth spot. First up they overcame Parkers by a margin of 20, before inflicting defeat on Angels who had started the day above them in the table. Bowl Rollers will not be happy after their afternoon out in the cold wind, recording their worst score and failing to hit the 100 point mark. Angels beat them with a total just three short of full house, before opponents Parkers went one better and missed out by just two. They remain ahead of Porters on an average of 105, but slip further behind Parkers who are now hunting down the Angels. Results for Sunday, November 6: Outsiders 117 (4), Parkers 97 (2); Bowl Rollers 86 (1), Louie’s Angels 123 (5); Parkers 124 (5), Bowl Rollers 97 (1); Louie’s Angels 98 (2) Outsiders 114 (4). A gang of 44 attended the usual midweek round robin outing and coming out on top were Philippa Taylor and James ‘T-bag’ Teare in the red doubles; John Lightfoot, Bernard Thackrah and Peter Kelly (yellow triples), and Derek Clarke, Tricia Bull and Shirley Fargher in the black triples. Runners-up were Jacqui Elliott and Janet Monk; Hazel and Peter Hughes, with Alec Taylor and Lil Smith, Mark Kelly and Doug Allan. 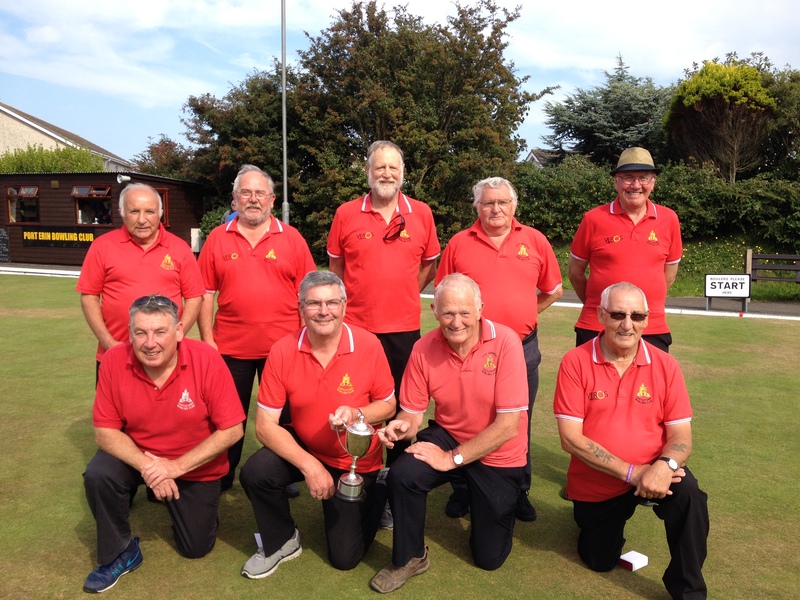 Four of the leading six teams took part in the one day of action at the weekend in the Manx Petroleum sponsored Outdoor Winter Bowling League and it was all change at the top once again. Mooragh Lakers are the new leaders after they dropped just two chalks during a session which saw them rack up their third and the campaign’s seventh maximum score. Opponents first time out were Parkers, but they fell short as the Lakers stormed to their sixth victory, although I feel the singles games were well fought with the lowest loser reaching 15. Also competing were Louie’s Angels, leaders on average at the start, and Seven-Up, who occupied fourth spot and it was the latter who sneaked home with a winning margin of just eight points. Match details with Angels first: Rebecca Teare 21, Alison Keggen 10; Thomas Keggen 19, Alec Taylor 21; Tricia Bull 16, Philippa Taylor 21; Marg Tasker 18, Kevin Quirk 21; Matthew Keggen 21, Jordan Cain 18; Rita Callister and Ken Karran 9, Nigel Thomas and Steve Crampton 21. Louie’s Angels 104 (2), Seven-Up 112 (4). Seven-Up then took on Parkers and secured a 5-1 victory, but their points total for the afternoon was not enough to see them improve their average, although they did move up one position. This was helped by Lakers recording a full-house against an Angels team that slipped down to fourth in the standings after they struggled to a tally of 84. Results for Sunday, October 30: Parkers 96 (1), Mooragh Lakers 124 (5); Seven-Up 123 (5), Parkers 95 (1); Mooragh Lakers 126 (6) Louie’s Angels 84 (0). Prior to the league fixtures two round robins took place with good entries in both. The midweek session had 48 entrants, which were split into triples and doubles, with the winning pair being David Galbraith and Mike Skelly, with second going to George Brew and Vicky Lloyd-West. Voirrey Curphey, Colin Spence and Ken Karran won the black jack triples group ahead of Jeff Wilson, George Peach and Carol Kaye; while the yellow victors were Steve Parker, Derek Clarke and Graham Ogden, second spot going to Glen Boland, Roma Ware and Tricia Bull. Saturday saw the first weekend session with 28 competing in two groups of doubles, with yellow winners being Ken Karran and Caroline Whitehead, second went to Bernard Thackrah and James Teare, and in third it was Carol Kaye and Shirley Whelan. Just three points separated the top four in the other group and after roll-ups for first and third the successful duos in order were Peter Hughes and Terry Bates; Janet Monk and Graham Ogden; Steve Parker and Lynda Cadamy. Missing from Nobles 3 over the weekend, was winter club stalwart Louis Callister, who spent a couple of days in hospital; also Louie’s Angels member Debbie Leece who at the time of compiling this column was still receiving treatment. We wish them both a speedy recovery. 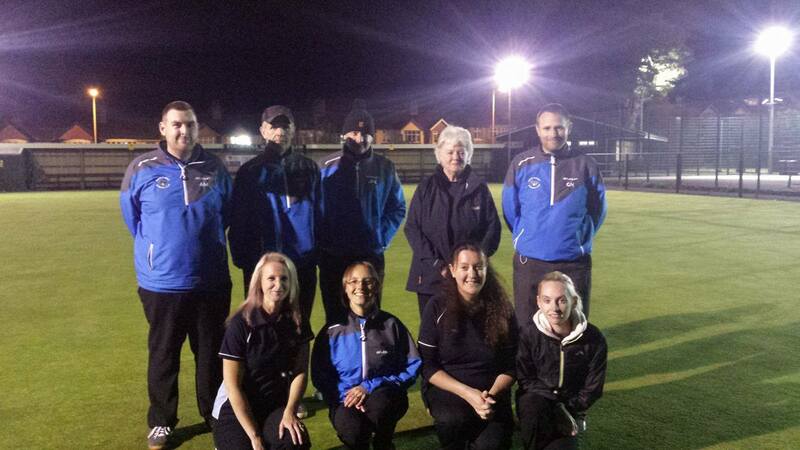 An afternoon of two halves is the only way to describe Saturday’s action between the leading two in the Manx Petroleum sponsored Outdoor Winter Bowling League, as they went head-to-head twice in the one session. Mooragh Lakers began with the smallest of margins over opponents Seven-Up and after a convincing victory over their rivals in the opening clash they extended that gap to 22 points. The two sides then faced each other once again, but what a turn around as Seven-Up narrowed that advantage back down to just seven points with almost a reverse of the first encounter. The biggest benefactors, without even playing, were Louie’s Angels who moved to the top of the standings as both competing teams saw their averages tumble. Also enjoying the perfect weather were Outsiders who racked up a total of 236 points from their two outings against Bowl Rollers, who themselves only won two individual games but averaged almost 100 points. Results for Saturday, October 22: Mooragh Lakers 120 (4), Seven-Up 99 (2); Outsiders 119 (5), Bowl Rollers 108 (1); Seven-Up 110 (4), Mooragh Lakers 95 (2); Bowl Rollers 91 (1), Outsiders 117 (5). Sunday saw the season’s sixth maximum scoreline when Unstopabowls left Castletown Corkers trailing home with the lowest score to date. This while Govags notched up their first success with victory against Castletown Cannons, the teams being separated by just 10 points. Unstopabowls then took their average to within touching distance of the leaders and into third spot, when they dropped just one game in a victory over Govags. Finally the two Castletown sides faced each up to each other, with the Cannons coming out on top by four games to two and leaving their stablemates at the bottom of the table. 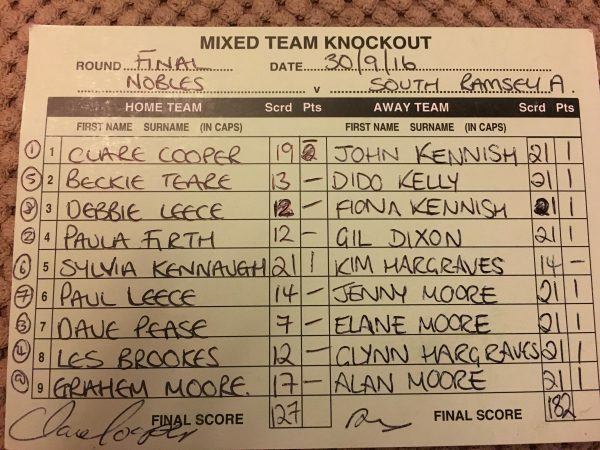 Match details (Corkers first): Linda Richman 12, John Alderson 21; Rob Sayle 9, James Drinkwater 21; David Quayle 11, Alan Phair 21; Kevan Osborn 21, Bob Daggett 11; Byron Mercer 12, George Peach 21; Tracy Moore and Sonya Mercer 21, Peter Curtis and Elaine McElroy 17. Result: Corkers 86 (2), Cannons 112 (4). Other results for Sunday, October 23: Castletown Cannons 104 (2), Govags 114 (4); Unstopabowls 126 (6), Castletown Corkers 65 (0); Govags 89 (1), Unstopabowls 119 (5). An entry of 48 took part in the midweek round robin session, with triples once again being the option for the three gangs. Comfortable winners from the black jacks were Derek Clarke, Janet Monk and Bernard Thackrah; with second going to David Galbraith, Graham Ogden and Jeff Wilson. Vicky Lloyd-West, Elaine Moore and Tricia Bull triumphed in the red section, ahead of Derek Allen, George Brew and Paula Firth. In the yellows, the winners were Steve Parker, Barbara Young and Jean Thackrah, with runners-up being Marg Tasker, Pauline Worrall and Alan Moore. With league games on schedule, there will be a round robin this Saturday (weather permitting), followed by a set of fixtures on Sunday. The top three sides all changed positions after the latest two days of action in the Manx Petroleum sponsored Outdoor Winter Bowling League, which saw another three maximums recorded. Starting the sessions in third spot was Seven-Up and they could not have done any more in their quest to take-over the number one position. Firstly they defeated Castletown Corkers by a margin of 58, before beating Govags, on their way to maximum points for the afternoon and in the process took their average to 124.3, as they aim to win their first title. Out to deny them top spot were Mooragh Lakers, another side trying for their first success, they began the weekend with a two-point advantage. Lakers matched their rivals with a full-house in the opener when they beat Govags, before dropping just one chalk against Corkers and so stay above Seven-Up by the closest of margins, on an average of 124.5. Results for Saturday, October 15: Mooragh Lakers 126 (6), Govags 80 (0); Seven-Up 126 (6), Castletown Corkers 68 (0); Govags 85 (0), Seven-Up 126 (6); Castletown Corkers 86 (1), Mooragh Lakers 125 (5). Saturday’s results meant that early pacesetters Louie’s Angels had to be at the top of their form in the second session to move back to the summit. First up they had to overcome Bits n Bobs, which they did by winning five games, but dropped four points in their loss to relinquish the overall lead to Lakers. Later Angels took on Erin Porters and with all the teams having heavy rain showers to contend with, they recorded a fourth result of 120 and above to average 122.5 and slip to third. Parkers were also in action and finished their outing with a comfortable victory over Bits n Bobs, but prior to this had a tough battle with Erin Porters. A fixture, which was won on games by the southerners, but Parkers just sneaked home with a two point winning advantage. Match details (Porters first): Lynda Cadamy 21, Terry Moore 15; Derek Cadamy 9, Rob Cowley 21; Carol Kaye 13, Bernie McPhee 21; Caroline Whitehead 21, Brian Woodall 18; Bernard Thackrah 21, Paul Bailey 13; Chris Dent and Jacqui Elliott 21, Mike Thomas and Peter Karran 20. Erin Porters 106 (4), Parkers 108 (2). Remaining results for Sunday, October 16: Bits n Bobs 93 (1), Louie’s Angels 120 (5); Louie’s Angels 122 (5), Erin Porters 108 (1); Parkers 119 (5), Bits n Bobs 96 (1). The midweek round robin saw a repeat entry of 45, which was once again sorted into three gangs of triples. There were some very close outcomes with the red jacks being won by Derek Clarke, Ken Clarke and Terry Bates, just one point ahead of Julie Reilly, Jack Lee and Voirrey Curphey. The yellows were settled after a roll-up following two trios ending on the same total. Eventual winners Lynda Clarke, Derek Cadamy and Shirley Fargher; just pipping Lynda Wilson, George Brew and Tricia Bull. The remaining section was won by Roma Ware, Alan Moore and Doug Allan, with second, after another roll-up, going to George Peach, Steve Waters and Shirley Whelan. There were six scores just falling short of maximums last week in the Manx Petroleum sponsored Outdoor Winter Bowling League, two of them going to Louie’s Angels who became the early pacesetters at the top. They dropped just four points from two outings and staked their intention to improve on the fourth spot they occupied at the end of last season. First up were opponents Castletown Corkers, who managed to win two games but only by the closest of margins at 21-20; next Angels took on a new look Govags side and emerged with another total of 124. Some consolation for the westerners was their winner, Vicky Lloyd-West, who has recently joined the winter club for the first time. Parkers meanwhile will be another team aiming to improve on their last finish as they ended the campaign in the bottom half of the table. In their first encounter they beat Govags with a total of 119, before leaving Corkers with the lowest tally of the afternoon in a 124 to 89 victory. Results for Saturday, October 8: Parkers 119 (5), Govags 92 (1); Louie’s Angels 124 (4), Castletown Corkers 97 (2); Govags 96 (1), Louie’s Angels 124 (5); Castletown Corkers 89 (1), Parkers 124 (5). Sunday’s programme began with what was perhaps the weekend’s surprise result, which saw Erin Porters overcome Outsiders by a margin of 12 in what was the first scoreline where both sides reached 100 points. Also in action were Bits n Bobs and Bowl Rollers, with the outcome going in favour of the Rollers who fell just short of a maximum; they repeated the same total later against Porters who couldn’t carry their earlier form forward. Match details (Rollers first): Shirley Whelan 21, Ken Clarke 18; Shirley Corrin 21, Jacqui Elliott 12; Lil Smith 21, Caroline Whitehead 13; Gordon Corrin 21 Chris Dent 15; Wendy Cowin 17, Bernard Thackrah 21; Terry Bates and Sylvia Kennaugh 21, Carol Kaye and Derek Allen 14. Result: Bowl Rollers 122 (5), Erin Porters 93 (1). Outsiders finished the two days of action with a score just three short of a possible 126; they lost out in the doubles on 18 against Bits n Bobs who are also introducing some new players into winter bowls. Remaining results for Sunday, October 9: Erin Porters 112 (4), Outsiders 100 (2); Bits n Bobs 80 (1), Bowl Rollers 122 (5); Outsiders 123 (5), Bits n Bobs 95 (1). The first midweek round robin session attracted a great entry of 45, which was split into three groups of triples, with the eventual winners being Mike Skelly/Paula Firth/Tricia Bull; Pauline Worrall/Derek Allen/Derek Anscomb; also Bernard Thackrah/Rob Cowley/George Brew. Just missing out in second were Philippa Taylor/Erwin Gelling/Mike Ware; Margy Tasker/Ken Clarke/Peter Karran and Roma Ware/Peter Kelly/Voirrey Curphey. Just hours after the final trophy was decided in one section of Isle of Man bowls, the Manx Petroleum sponsored Outdoor Winter League Bowling Club rolled into action with a slightly changed format. With the winter campaign being as popular as ever it was decided at the annual general meeting to increase the number of players in a team to seven, with games to be played as five singles and one doubles. Seems like a good time to try something new in this column also, so we will introduce a match of the weekend scorecard and feature the results from that particular fixture, beginning with the match between Unstopabowls and Outsiders. The action began on Saturday with last season’s second and third placed sides setting the early pace, they dropped just 12 points between them and recorded a maximum apiece in the process. Seven-Up notched up theirs against Erin Porters, whilst Mooragh Lakers left opponents Bits n Bobs trailing on a total of just 71; both victors having earlier recorded good scores in their openers. Results for Saturday, October 1: Mooragh Lakers 121 (5), Erin Porters 88 (1); Seven-Up 119 (5), Bits n Bobs 80 (1); Erin Porters 90 (0), Seven-Up 126 (6); Bits n Bobs 71 (0), Mooragh Lakers 126 (6). With the extra player being introduced into each team, there were new faces in action on both days, even current champions Unstopabowls made a few changes. However, the revised format might not be to their liking, after they lost both doubles on their way to an overall points total of 229. First up they beat Bowl Rollers, before they took on Outsiders, who had earlier triumphed against Castletown Cannons. In their second outing Bowl Rollers recorded the highest tally of the session with 120 points from their clash with the Cannons. Unstopabowls and Outsiders, are two teams fancied to battle for honours and they competed in the closest outcome of the weekend, which went in favour of the champions by a margin of 13 points. Match details being as follows: (Outsiders first) Tony Dugdale 21 Steve Waters 13, Mike Alexander 15 Kim Hargraves 21, Sid Bolton 20 Glynn Hargraves 21, Frank Watson 13 Stefan Kelly 21, George Brew 9 Alan Moore 21, Ben Dugdale and Lyn Bolton 21 Elaine Moore and Glenn Boland 15. Result: Outsiders 99 (2),Unstopabowls 112 (4). Remaining results for Sunday, October 2: Castletown Cannons 89 (2), Outsiders 112 (4); Unstopabowls 117 (4), Bowl Rollers 94 (2); Bowl Rollers 120 (5), Castletown Cannons 95 (1). South Ramsey retained the Ellan Vannin Fuels Mixed Team Championship with a convincing 182-127 (8-1) win over Nobles. South have dominated the Mixed Team competition since 2008 notching up their 7th title tonight. The Mens Association would like to pass their thanks to the sponsors Ellan Vannin Fuels, Finch Hill, Nobles & Douglas for the use of their green and the club members who have been on hand to assist on the night. Bethany Kennish won the first Junior Manx Masters beating Sarah Quirk in the final. The event was well supported with a good entry of 13 juniors. The early stages were played in a round robin format. There was some excellent bowling from these games that would not have been amiss in the seniors competitions that were taking place later on. Qualifiers from the round robin stages were Bethany, Sarah, Austin Hart & Glenn Boland. Bethany & Sarah came through tough semi finals against Glenn & Austin respectively. In the Ladies event Elaine Moore beat daughter Jenny Moore 21-8. Losing semi finalists were Shelley Kennish & Mary Moffatt. Losing out in the quarter finals were Kath Kinley, Janet Monk, Philippa Taylor & Fiona Kennish. The Men’s competition had a field of 32. The eventual winner was John Kennish beating South Ramsey team mate David Bradford 21-3. Losing semi finalists were Glynn Hargraves & Kevin Quirk. Losing out in the quarter finals were Chas Grills, Rob Monk, Ewan Cooil & Trevor Quayle. Castletown followed up their recent Ismay Cup win by reclaiming the Over 60’s League Title, which went right to the wire winning the League effectively on ‘goal difference’.